BeefISO™ Beef Protein Isolate, Cocoa Powder, Medium Chain Triglycerides, Natural And Artificial Flavors, Sucralose, Acesulfame Potassium, Salt. Add one heaping scoop to 8 oz (240 ml) of water or any other drink and stir. 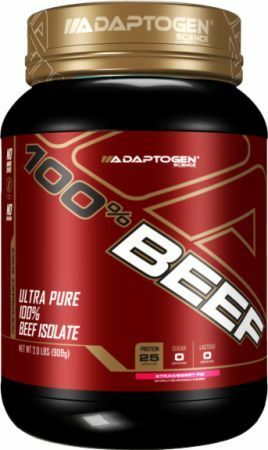 BeefISO™ Beef Protein Isolate, Medium Chain Triglycerides, Natural And Artificial Flavors, Citric Acid, Sunflower Lecithin, Cellulose Gum, Sucralose, Malic Acid, Acesulfame Potassium, FD&C Red 40. 100% Beef protein is a USDA produced Beef Protein Isolate that is manufactured from fresh raw beef, NON-GMO, tested free of hormones, cholesterol free and gluten free. 100% Beef is sugar Free and has no cholesterol. It is also both gluten and lactose free. 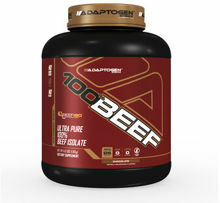 100% Beef protein is a USDA produced Beef Protein Isolate that is manufactured from fresh raw beef. Adaptogen Science’s main concern is searching around the world for the best of the best ingredients available to use in our products. As a result, we use BeefISOTM, which is a Beef protein powder isolate with 99% protein. Everything You Need... Nothing You Don't. We don’t add any amino acids or Creatine, which would only count as lower quality protein! 100% Beef is sugar free and has no cholesterol. It is also both gluten and lactose free, providing a great alternative for those who must avoid lactose (small amounts of lactose are found in all milk proteins like casein and whey protein) because of allergies or intolerance. Beef protein powder is an effective way to supplement protein into your diet without adding unnecessary carbs, sugars, fats, or choloesterol. Proliant BeefISO is a USDA produced Beef Protein Isolate that is manufactured from fresh raw material. No additives or artificial ingredients. Beef protein has a reputation of not being the best tasting protein... We crushed this paradigm! After comprehensive research and development, we have creaed the BEST and TASTIEST beef protein on the market. Our customers love the smooth texture, nutrition and awesome taste!